The House of Beaufort is an English noble family, which originated in the fourteenth century and played an important role in the Wars of the Roses in the fifteenth century. 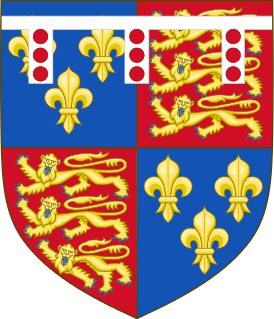 The name Beaufort refers to Montmorency-Beaufort (France, département de l'Aube, Champagne), once the possession of John of Gaunt, 1st Duke of Lancaster, third son of King Edward III. The family is descended from John of Gaunt by his then-mistress Katherine Swynford. Gaunt married Swynford in 1396, and their children were legitimized by Richard II and Pope Boniface IX. 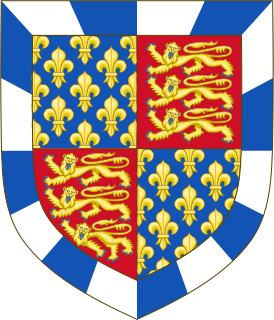 They had four children: John (1373–1410), Henry (1375–1447), Thomas (1377–1426), and Joan (1379–1440). 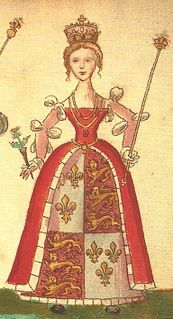 The House of Tudor was descended from the Beauforts in the female line and all subsequent English and British monarchs are descended from the Tudors. The House of Beaufort continues to exist; its members now use Somerset as their surname. The current, 12th Duke of Beaufort is Henry Somerset, a direct male-line descendant of Edward III. The Beauforts were a powerful and wealthy family from the start, and rose to greater power after their half-brother and uncle became King Henry IV in 1399. However, in 1406, Henry IV decided that although the Beauforts were legitimate, their genetic line could not be used to make any claim to the throne. John Beaufort had already been created Earl of Somerset in 1397. His second son John became the first Duke of Somerset in 1443. The second son (of John of Gaunt), Henry, became a bishop, Lord Chancellor, and a Cardinal; the third son, Thomas, became Duke of Exeter; and the daughter, Joan, married Ralph Neville, 1st Earl of Westmorland. Joan had the most pedigree, her many descendants including the Dukes of York, Warwick the "Kingmaker", the Dukes of Norfolk, the Dukes of Buckingham, the Earls of Northumberland, and Henry VIII's last queen, Catherine Parr. When the dynastic struggle known as the Wars of the Roses broke out in the later fifteenth century, the Beauforts were the chief supporters of Henry VI and the House of Lancaster. Henry VII traced his claim to the English crown through his mother, Margaret Beaufort, granddaughter of John Beaufort, and great-granddaughter of John of Gaunt. The Beauforts suffered heavily in the Wars of the Roses. Edmund Beaufort, 2nd Duke of Somerset and his three elder sons were killed in the war, leaving no legitimate male heir. The male line was continued through Charles Somerset, 1st Earl of Worcester, illegitimate son of Henry Beaufort, 3rd Duke of Somerset. Henry Somerset, 3rd Marquess of Worcester (1629–1700) was the great-great-great-great-grandson of Charles Somerset. He assisted in the Restoration to the throne of Charles II. In 1682, Charles created Henry Somerset the first Duke of Beaufort. 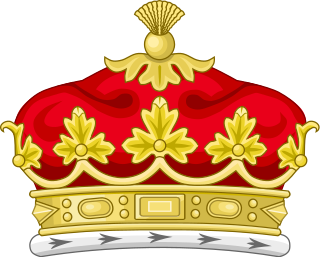 The Beaufort family in the male line is today represented by its cadet branch the House of Somerset, whose senior representative is Henry Somerset, 12th Duke of Beaufort. John Beaufort, 1st Earl of Somerset (c. 1371–1410). Henry Beaufort, 2nd Earl of Somerset (c. 1401–1418). John Beaufort, 1st Duke of Somerset (c. 1404–1444). Edmund Beaufort, 2nd Duke of Somerset (c. 1406–1455). Henry Beaufort, 3rd Duke of Somerset (1436–1464). Edmund Beaufort, 4th Duke of Somerset (c. 1438–1471). ^ Amin, Nathen. "The Wars of the Roses: York v Beaufort? ", History Extra, The official website for BBC History Magazine and BBC World Histories Magazine. Accessed 25 October 2018. ^ a b Pinches & Pinches 1974, p. 86. This article incorporates text from a publication now in the public domain: Chisholm, Hugh, ed. (1911). "Beaufort" . Encyclopædia Britannica. 3 (11th ed.). Cambridge University Press. Henry Beaufort, 2nd Earl of Somerset was the eldest son of John Beaufort, 1st Earl of Somerset, and the grandson of John of Gaunt, 1st Duke of Lancaster and Katherine Swynford. Edward Nevill, de facto 3rd Baron Bergavenny was an English peer.